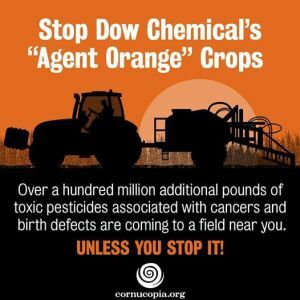 The U.S. Environmental Protection Agency, ignoring more than 60 members of Congress and a half a million citizens, late yesterday approved a deadly new herbicide, Dow’s Enlist Duo, made from a combination of . Please Take action – and share this link — your health and the health of all your friends and family is at stake. I wouldn’t want any of you ingesting this herbicide or insecticide. Educate yourself. This makes as much sense as allowing someone to smoke in a cardboard box with your children or grandchildren. This is about control and profit margins nothing else. The following from Jeffrey M. Smith. In 2010 President Obama appointed Michael Taylor to senior advisor to the commissioner of the FDA. He is now America’s food safety czar. . He had been Monsanto’s attorney before becoming policy chief at the FDA. Soon after, he became Monsanto’s vice president and chief lobbyist. GMOs were rushed onto our plates… in 1996. Over the next nine years, multiple chronic illnesses in the US nearly doubled — from 7% to 13%. Allergy-related emergency room visits doubled between 1997 and 2002 while food allergies, especially among children, skyrocketed. We also witnessed a dramatic rise in asthma, autism, obesity, diabetes, digestive disorders, and certain cancers. Dr. P. M. Bhargava, one of the world’s top biologists, reviewed over 600 scientific journals, he concluded that the GM foods in the US are largely responsible for the increase in many serious diseases. The American Academy of Environmental Medicine concluded that animal studies have demonstrated a causal relationship between GM foods and infertility, accelerated aging, dysfunctional insulin regulation, changes in major organs and the gastrointestinal system, and immune problems such as asthma, allergies, and inflammation. A report by eight international experts determined that the flimsy and superficial evaluations of GMOs by both regulators and GM companies “systematically overlook the side effects” and significantly underestimate “the initial signs of diseases like cancer and diseases of the hormonal, immune, nervous and reproductive systems, among others.” This paragraph was researched and written by Jeffrey M. Smith. He is the author of Seeds of Deception: Exposing Industry and Government Lies About the Safety of the Genetically Engineered Foods You’re Eating and Genetic Roulette: The Documented Health Risks of Genetically Engineered Foods from Chelsea Green Publishing. Smith worked at a GMO detection laboratory, founded the Institute for Responsible Technology, and currently lives in Iowa—surrounded by genetically modified corn and soybeans. For more information, visit Chelsea Green.